5G is coming...is your business prepared? 5G is the buzzword of the moment and it’s not surprising why. According to Qualcomm, it’s expected to create 22 million new jobs and contribute a $12.3 Trillion economic benefit across the globe by 2035. As the name suggests, 5G is the fifth generation of mobile networks, promising more speed and lower latency. Beyond performance benefits, it’s also set to underpin Industry 4.0 where everything is connected, processed and digitised. Yet, 5G is currently tricky to pin down and its full arrival is still a long way off, but one thing is for sure, it will impact your business. 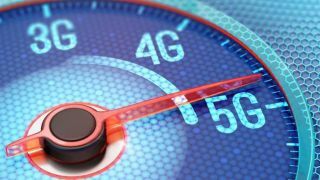 Five Eyes "needs major 5G vendor"
While the UK was a disappointing 54th to launch 4G in the global race, it will be in the first wave of countries to adopt the new networking technology. There are three bands of 5G: sub 1GHz (cheap and offers wide coverage, yet slower speeds); 3.4-3.8 GHz (the main frequency layer) and >6GHz (high bandwidth with low latency). Speeds in some bands will be well in excess of 1Gb/s. The major networks, including EE, Three, Vodafone and O2 have all started initial roll outs of 5G in high traffic areas. Vodafone recently completed a live test after winning the largest block of spectrum in Ofcom’s 5G auction at Birmingham New Street Station, creating the UK’s first 5G train station. At this year's Mobile World Congress (MWC) in Barcelona, every smartphone manufacturer showed off a new 5G device. However, it won’t be until 2020 at least until the 5G revolution really kicks off here and its likely urban centers – where all trials have been held so far - will benefit first. Having said that, the race to 5G is at risk of slowing as it requires extensive government approval. Not to mention the fact the U.S is still trying to ban Huawei, the Chinese supplier of high-speed telecoms systems over fears this would help China conduct espionage or cyber sabotage. It seems the UK believes this risk can be mitigated without banning Huawei from the 5G network, according to recent headlines. So, looking forward, it’s unclear when exactly UK businesses will benefit from the 5G network, but rest assured it’s coming. There’s a lot of talk about 5G as a consumer technology but less about how it’s set to benefit businesses. The start with, it will certainly improve the experience of remote working and collaboration. Today, over 50 percent of staff work away from their main office at least 2.5 days a week which while giving businesses agility, improved scheduling and lower staff turnover, can make connecting, sharing and engaging teams difficult. Enter 5G. Network-related tasks, such as online sales or sharing large files in the cloud will become faster and more efficient, even on mobile devices without the need to connect to WiFi, giving businesses huge productivity gains and boosting staff morale. After all, there’s nothing more frustrating than a slow internet connection. As well as connecting people, 5G will connect things, vastly expanding the capabilities and application of IoT which demands better and faster connectivity. In fact, 5G will enable device-to-device communications for up to a million devices per square kilometer. This opens-up huge opportunities for IoT innovation and commercial use - from driverless cars, drones, Artificial Intelligence, robotics and remote-controlled machinery, and virtual and augmented reality - giving businesses at the forefront of creating and using such technologies a competitive edge. A very clever example of what’s possible is provided by Vodafone’s 5G connected crane, allowing an operator hundreds of miles away to have full remote control of the crane (or indeed multiple cranes in different locations). This 5G-enabled teleoperation solution could transform the construction industry and many others, increasing site safety and reducing idle time. As with any new technology, it pays to be fully prepared and those who are will gain first mover advantage. Every business, no matter its size or sector, should be thinking about how 5G could benefit them and their customers. Before jumping in, it’s important to clearly lay out the key investment areas to prepare your business for 5G’s arrival. Knowing how you want to use 5G is much more valuable than being an early adopter who doesn’t. Consider appointing an internal person or team to spearhead the project, working with the support of external experts where needed. Senior representatives from different departments should also be encouraged to feed in to help identify current road blocks and possible areas for innovation. Future-proofing your network infrastructure is also a must for any adopter of 5G. If the access network attached to 5G is poor, you will just move the bottleneck. If you haven’t already, consider transitioning to a virtual network – the process of consolidating the physical hardware into a single software-based entity – which will be more fluid, dynamic and flexible. The very attributes which make 5G so valuable create new cybersecurity risks. A wider attack surface with more devices connected to the network and files being transferred across it, opens-up vulnerabilities. As the evolving threat landscape becomes clearer as the full deployment of 5G edges closer, it’s important security protocols do not cancel out the productivity gains businesses are looking forward to by slowing or preventing authorised access. With the growth of BYOD and remote working, business leaders are well versed in the risks associated with a blurred security perimeter. However, 5G brings new security concerns as hybrid computing becomes the norm, combining the risks of endpoint computing with those of cloud computing. In response to these concern, the UK Government’s 5G Testbeds are focusing on the principle of “security by design”, whereby 5G networks, software and apps are designed with security at the core with the flexibility to adapt in the face of evolving threats. A zero-trust security model is considered to be the safest way to mitigate the risk factors associated with 5G networks. Security on a zero-trust basis centers on the data, with every access request being verified, validated and authenticated. For example, 5G devices could recognise sensitive documents being accessed on the move during an employee’s commute and the virtual network could provisionally block access until the user is in a suitable place to access such documents. While many people will be taking advantage of 5G in the correct way, others will be focused on undermining it. Businesses need to bear this in mind when adopting 5G, or in fact any new technology, and adapt their security protocols accordingly to stay protected.